Breathe Easy and Regain Good Health! According to the National Heart, Lung and Blood Institute, COPD is the third leading cause of death in the United States. Stem cell technology is quite promising and regenerative medicine has a lot of potential in treating debilitating diseases. We offer comprehensive treatment protocols for chronic lung failure using stem cells. 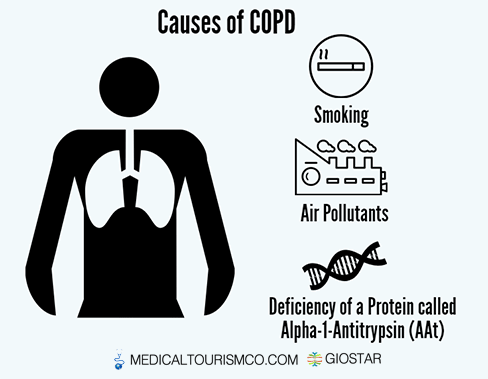 Why Us in Mexico for COPD Stem Cell Treatment? Our stem cell programs are highly personalized and made up of 3-4 applications. Our multi-application approach contrasts with other stem cell clinics in Mexico which do a single application first and before carrying out another application wait for the outcomes. We are a research-oriented company and what really sets us apart from other stem cell centers in Mexico is our lab work and the use of differentiated stem cells. Other centers in Mexico simply re-inject stem cells without differentiating them. For the purpose of therapy we use induced pluripotent stem cells (iPSCs). We have the technology to extract stem cells from adipose tissue, turn back the clock on them to render them blank, multiply them into millions, and coax them to differentiate into the desired cell form with specialized functions that would help repair the damage done by a condition and replace the destroyed cells. Unlike other stem cell centers in Mexico which infuse cells without differentiating them, we use only differentiated stem cells. We are adequately equipped to extract mesenchymal stem cells from the adipose tissue, which are further processed and multiplied. We make use of induced pluripotent stem cells (iPSC) by reversing their aging and rendering them blank so that they can differentiate into specific cells that would help treat the problem. Our comprehensive packages cost much lower than in the US, and include complete trip assistance – right from arranging hotel stay to ground transfers. The founder of GIOSTAR, Dr. Anand Srivastava, is a top name in stem cell research, and has played a central role in establishing stem cell research programs at UCI, UCSD, Sanford Burnham Prebys Medical Discovery Institute, and Salk Institute for Biological Studies. Since this is an ever-evolving science, we have our own team of scientists dedicated to stem cell research. We currently offer stem cell therapy for chronic lung diseases in Tijuana, Guadalajara, and Los Algodones. All the facilities are well-equipped and duly licensed to perform stem cell treatment. GIOSTAR is a prime name in stem cell research and therapy, and has helped over 4,000 people fight various auto-immune, degenerative and blood-related disorders for more than 16 years. It was founded by Dr. Anand Srivastava, a recognized name in regenerative medicine who has received fellowships and awards from illustrious bodies worldwide. GIOSTAR has collaborated with Medical Tourism Corporation to make stem cells more accessible to the Americans. It will also be having dedicated hospitals for stem cell therapy in Brazil, Thailand, the UAE, and Colombia, and is actively working with the governments of these countries for making regenerative therapymore available. GIOSTAR has also joined hands with the government of India in establishing a one-of-its-kind, largest stem cell hospital in the world which is also being endorsed by the prime minister of the country. ✔ It is a disease making it difficult to breathe and worsens with passage of time. ✔ A leading cause of COPD is smoking. ✔ Repeated contact with air pollutants, chemical fumes, and dust over a long period of time may also result in COPD. How a Lung Functions Normally and What Goes Wrong With COPD? ✔​ On breathing in, the air goes down the windpipe into the bronchial tubes (airways) in the lungs. ✔​ The airways further divide into thousands of tinier tubes called bronchioles. ✔​ The endings of the bronchioles are small air sacs known as alveoli. ✔​ Alveoli are the site where oxygen enters in and carbon dioxide gets pushed out. In other words, it is the place where gas exchange takes place. ✔​ The air sacs and airways in a disease-free lung are able to get back to their original shape after puffing up with air. ✔ The elasticity of healthy air sacs and airways helps in retaining the lung structure as well as allowing quick gas exchange. ✔​ In COPD air sacs get damaged, resulting in less amount of air coming in and moving out. ✔​ COPD results in the air sacs losing their elasticity as well as the destruction of the walls surrounding them (emphysema); as a result there are fewer but larger air sacs left which reduces the exchange of gas in the lungs. ✔​ The air sacs may get inflamed and produce abnormally high quantities of mucus (chronic bronchitis). Inflammation causes the lining of the airways to thicken and makes it difficult to breathe. It increases one’s susceptibility to cold, flu, and pneumonia. Respiratory infections can aggravate the damage to the lungs and make it even more difficult to breathe. COPD is known to increase the risk of heart attacks. People with COPD are more susceptible to lung cancer. COPD may result in pulmonary hypertension (high blood pressure in the lungs). Difficulty in breathing may interfere with the quality of your life, hampering you from enjoying activities you like. This may lead to depression. What Increases Risk of COPD? COPD is more common in people of 40 and above who are either into smoking or have smoked in the past. According to the COPD Foundation, almost 90% of people with it were into smoking. Certain occupations may result in people getting exposed to pollutants, such as chemicals, dust, and fumes for long periods of time. These pollutants may irritate the lungs. Long term exposure to passive smoke and cooking gases may also result in COPD. A rare genetic disorder which causes the deficiency of a protein called alpha-1-antitrypsin (AAt) is known to cause COPD in about 1% of the cases, according to Mayo Clinic. AAt deficiency induces the white blood cells to attack the lungs and cause them to deteriorate. How Stem Cells Help in Chronic Lung Failure? ✔ Stem cells are known for their capacity to self-renew and differentiate into cell types with specific functions, and therefore replace destroyed tissue. ✔ According to Kim Y-S et al (2017)1 mesenchymal stem cells (MSC) derived from adipose tissue are a good alternative to ethically-questionable embryonic stem cells as the former are low on provoking an immune response from the body. ✔ It has also been suggested that MSCs are successful in regenerating lungs. ✔ According to a 2016 study by Kim Y-S et al2 MSCs can reduce inflammation of the airways and renew alveolus of the lung in people with COPD caused by cigarettes and elastase. ✔ We have the technology to isolate MSCs from both autologous (from own body) and allogeneic sources (from a healthy donor). ✔ After isolating them we multiply the stem cells, render them blank, and induce them to differentiate to other specific cell types that help repair the damage. Our holistic approach towards stem cell therapy can significantly ameliorate the condition of people with emphysema, chronic bronchitis, and other problems associated with COPD. Oh DK, Kim Y-S, Oh Y-M. Lung Regeneration Therapy for Chronic Obstructive Pulmonary Disease. Tuberculosis and Respiratory Diseases. 2017;80(1):1-10. doi:10.4046/trd.2017.80.1.1. Kim Y-S, Kokturk N, Kim J-Y, et al. Gene Profiles in a Smoke-Induced COPD Mouse Lung Model Following Treatment with Mesenchymal Stem Cells. Molecules and Cells. 2016;39(10):728-733. doi:10.14348/molcells.2016.0095. Wecht, S. and Rojas, M. (2016) Mesenchymal stem cells in the treatment of chronic lung disease. Respirology, 21: 1366–1375. doi: 10.1111/resp.12911.